BROOKLYN, N.Y., Jan. 3, 2017 /PRNewswire/ -- Chargeworx™, a consumer-oriented leading provider of an exhaustive range of mobile accessories, including power banks and everything needed to effectively use them, is set to ramp up the charging speed with the introduction of its new, revolutionary SpeedBank power bank series that amazingly charges to full capacity 70 percent faster than typical power banks, charging up to 80 percent or more of capacity in just 30 minutes. While the actual speed it charges specific devices will vary by the type of device, charging times are equal to one-third that of any competitor's products. See the New Chargeworx SpeedBank Series of Power Banks at CES 2017 in the Fesco Group booth: #17317 Central Hall. "Our incredible record-shattering SpeedBank power banks get people back to living their life faster than they ever dreamed possible," stated Jared Melnicoff, Chargeworx Director of Product Development. "In this era of on-the-go digital electronics, a mobile device is totally useless if – when! – it loses power. And it will happen. Besides being used by humans who are prone to forgetfulness, Murphy's Law dictates that our smartphones and tablets will go powerless in the middle of something important. The new Chargeworx SpeedBank power bank ensures that when they do, users will be back at full power a whole lot faster than those folks using any other type of power bank." Time is everything. And no one wants to have to wait for a mobile device to recharge while they are making or irritating friends on social media, checking out today's scores, challenging the baddest video game villains, binge watching their favorite reality series, or any of a million other activities people use their mobile devices for. Now, when the power runs down – or totally out – a full recharge is close at hand. The powerful, lightning-quick Chargeworx SpeedBank power bank is specially engineered to get mobile devices back to full power in one-third the time of any other power bank. Even the SpeedBank colors evoke speed. There is a vibrant hot-rod red, a vivid yellow, and streaking-bullet silver. Designed for smartphones, tablets and portable electronics. 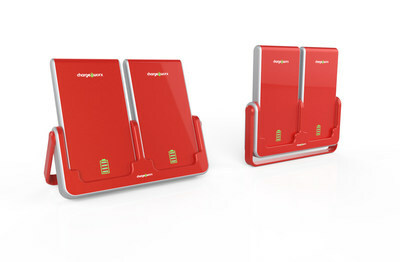 The new Chargeworx SpeedBank series of power banks will be available for an MRSP of $119.00 per unit. Bringing power to the people is what Chargeworx is all about – innovative power products that power everything from your smartphone to power banks large enough to power your refrigerator. The Chargeworx line includes everything needed to use them effectively – cables, latest USB ports, MFi-certified charging, wireless charging, and more. People – as in offering products that engineered to meet the unique needs individual users. Chargeworx has over 300 products and close to 3,500 sku's. Power without compromise, that's Chargeworx! Part of the Fesco Group, Chargeworx is headquartered in Brooklyn, NY. For additional information, visit www.chargeworxusa.com. © 2017 Chargeworx. All rights reserved.